Don’t be alarmed if a wire or band comes loose. This happens occasionally. If a wire protrudes and is irritating, use a blunt instrument (the back of a spoon or the eraser end of a pencil) and carefully, gently push the irritating wire under the archwire. Simply get it out of the way. If irritation to the lips or mouth continues, place wax or wet cotton on the wire to reduce the annoyance. 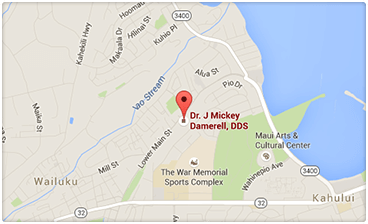 Call our office at (808) 244-1499 as soon as possible for an appointment to check and repair the appliances. If any piece comes off, save it and bring it with you to the office. If you play sports, it’s important that you consult us for special precautions. A protective mouth guard is advised for playing contact sports. In case of any accident involving the face, check your mouth and the appliances immediately. If teeth are loosened or the appliances damaged, phone at once for an appointment. In the meantime, treat your discomfort as you would treat any general soreness.